Training of trainers workshop was held concurrently in Ghana’s 10 administrative regions last Monday for the conduct of agriculture census after 33 years of recess. The last time a census of agriculture was carried out in the West African country was some 33 years ago, that is, in 1985. In a speech read by Mr James Ayarik, a Member of Steering Committee of Census of Agriculture on behalf of the Minister of Food and Agriculture at the closing session in Wa, the Upper West regional capital, said the training was crucial. He said the exercise was meant to equip trainees with the requisite knowledge to effectively train field personnel for data collection exercise across the Upper West Region. He called on the media to assist in the national exercise by creating public awareness, urging respondents to cooperate with field officers and providing the required data. He also appealed to chiefs, religious and other opinion leaders, to assist in the publicity campaign. “I trust that we can succeed as a country in this regard, if all stakeholders play their respective roles effectively,” he added. The census seeks to provide current information on the structure of agriculture in the country vital to the rebasing of Ghana’s Gross Domestic Product (GDP). It will also provide statistics on agriculture for policy makers to allocate public resources effectively and to better identify, prepare, implement and evaluate development projects aimed at promoting agriculture in the rural areas. It is anticipated that it will provide current information to help address environmental issues at the community level; and provide relevant information for use by stakeholders including farmers, researchers, students, international organisations and other organisations. Officials say reliable agriculture statistics will be generated for the purpose of planning, monitoring food security and livelihood requirements. Mr Jeremiah Sixtus Dery, the Upper West Regional Statistician of the Ghana Statistical Service (GSS) said training of enumerators and supervisor would concurrently take place in all the 216 Districts nationwide from 3rd to 12th April, 2018. He said the Census was a collaborative effort of the GSS and the Ministry of Food and Agriculture Organisation of the United Nations Organisation. The census is a major national exercise that will collect the latest information from households and institutions on the structure of agriculture in Ghana. The main data collection will be preceded by a listing exercise during which trained field personnel would visit all households and institutions to assign numbers to all structures and identify all households for the actual data collection exercise. 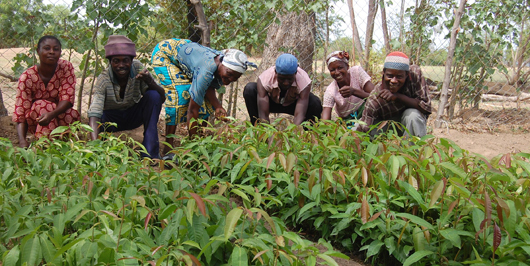 This is expected to be followed by the actual data collection exercise where enumerators would be visit all households and institutions engaged in the production of any type of food crop, livestock, aquaculture in both inland and offshore waters, as well as any type of tree planting activity, and enumerate them. The Census has been described as a huge statistical operation that requires active co-operation of the public, that is, households, institutions and individuals. The post Ghana to conduct agriculture census after 33 years break appeared first on Ghana Business News.